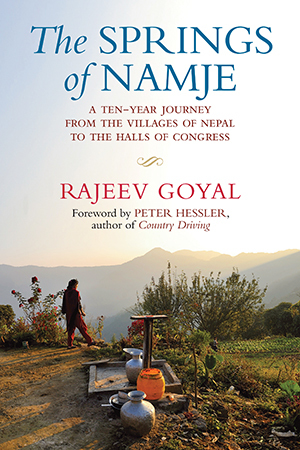 In 2001, Peace Corps volunteer Rajeev Goyal was sent to Namje, a remote village in the eastern hills of Nepal. Brimming with idealism, he expected to find people living in conditions of misery and suffering; instead, he discovered a village full of happy, compassionate people. After organizing the villagers to build a water-pumping system in the midst of the dangerous Maoist war that had gripped the country, Goyal learned how complex rural development truly is. He also witnessed how the seemingly lowliest villager can hold profound power to influence not only his or her own village but also the highest rungs of government. Years after this experience, Goyal applied the lessons he learned in Namje to his work on Capitol Hill. Approaching Congress as if it were a Nepalese caste system, Goyal led a grassroots campaign to double the size of the Peace Corps. His unique approach to advocacy included strategically positioning himself outside the men’s room of the capitol building waiting for lawmakers to walk out. As a result of his determined bird-dogging, Goyal managed to make allies of more than a hundred members of Congress and in the process, he ruffled the feathers of some of the most powerful figures in Washington. But due to his efforts, the Peace Corps was granted a $60-million increase in funding, the largest dollar-amount increase in the organizations history. On this path to victory Goyal endured a number of missteps along the way, and, as he reveals, his idealism at times faded into fear, anger, and frustration. In this honest and inspirational account of his life as an activist, Goyal offers daring ideas for how the Peace Corps and other organizations can be even more relevant to our rapidly changing world. He urges environmentalists, educators, farmers, artists, and designers to come together and contribute their talents. Filled with history, international politics, personal anecdotes, and colorful characters, The Springs of Namje is a unique and inspiring book about the power of small change. "An honest and inspiring look at the hard work and reward of development efforts." "Engaging account of his failures and successes in both countries is an edifying and inspiring triumph." Overhead a falcon hovered in a tight circle, peering at the strange new visitor below. The only sound I could hear was a faint whistling from the gentle Himalayan winds brushing against the sharp pine needles. A meaty smell filled my nostrils, which I would later learn was the odor of leopards, known to occasionally devour infants in Silanga village. On a map Nepal was barely large enough to contain the letters of its name, but from Kathmandu it took us three full days to get to Baitadi, and now the driver was gone and I felt very alone. Holding my dented steel suitcase with both hands as if carrying a body, I followed the faded trail through the forest, hoping it would lead to my new home. It seemed that before I could put my things down, they were being carried into the spare stone abode of Premraj Pant, the former village council head, who was known to all simply as Pradhan ji ( ji was a commonly used suffix of respect in Nepal), or “the chief.” Silanga village was two lines of mud homes facing each other, with a walking trail in the middle, situated on a bright sunny ridge and surrounded on all sides by fading farming terraces. Pradhan ji was a wiry, energetic man with a sharp nose and warm black eyes. He always wore a pressed white shirt and a vest, even when working in his cornfield, as if any moment a phone call might summon him back into political office. He had the personality of a pushy salesman, but I nonetheless took an instant liking to him and to his house. One of my favorite pastimes became peering at the white Himalayas through the bright crimson leaves of the rhododendron tree just outside my window. The house had a second story where various agricultural tools, including a hoe, and a tall pile of desiccated blue corn seeds were stored.There was a spot in the roof where the clay tiles didn’t quite meet and a beam of glittery light often shot through the length of the whole house.The cramped second story, which had a slanted roof, was where I liked to sit and read. I usually had my morning tea there. I thought that in Baitadi I would have a solitary life, but people were always around. In fact, my house had a porous quality. Adjacent to the front door, one of the stones in the wall had been dislodged, and often I would see Pradhan ji’s hand holding a cup of steaming tea. One night when I sneezed and rolled over in my bed, someone pushed a rag through the floorboards. A few steps from my house was a chia pasal (tea shop), which had an unusually loud radio set that always faced in the direction of my room. Every morning I woke to the familiar patriotic Radio Nepal theme song and the sound of hot tea being poured as a sieve was tapped against a steel cup. Usually when I opened the door, a few old men were seated in the courtyard having tea and talking politics, and sometimes I sat in and listened. It was as if the courtyard of my house was an extension of the tea shop. But when I went for walks, I often found myself standing completely alone on a trail, no trace of life in any direction for miles. Sri Siddhinath Middle School had approximately two hundred students in. My routine was teaching four English classes a day, in grades four through seven. The classrooms were made of stone and quite simple, without any teaching materials to speak of, but I found it wonderful to teach in this quiet setting. During the breaks, when I wasn’t planning lessons, I sat in on the other teachers’ classes so that I could listen to Nepali and improve my language skills. Physically, the school was a small L-shaped, whitewashed building that sat on a large field and exuded a feeling of peacefulness. Along one of the edges of the field, a precipitous fifty-foot drop accentuated the serene telephoto view of the succession of mountains. I often took my class outside. Sometimes I felt like I was teaching everyone in the school, as eyes would be peering at us from all the classrooms. In training, we had learned a simple game of hanging a long string and letting the students use folded index cards to make sentences. It was a great way to teach word order and also the flexibilities of language. There was no library and the modest science equipment we had was locked up behind the headmaster’s desk. Our teachers’ room had a poster of Nepal’s monarchs next to a rather graphic skeletal drawing of the human body, which marked the names of the different muscles and nerves. The dynamics of a small village school are such that the teaching staff gets very close. The other teachers constantly invited me to their homes for meals, and visiting them was a way for me to learn more about the village. There were two teachers whom I grew particularly close to. The first, Fagendra Pant, was my counterpart and spoke English in a gruff, almost Germanic style. He seemed to view the language as a way to punish and humiliate his students. The other teacher was Krishna Air, who had a dazzling knowledge of the language and was always surprising me with the vocabulary he knew. Whenever I was in the teachers’ room during breaks, they would compete for my attention to practice their English. After teaching all day at Sri Siddhinath School, in the evenings when I came home I would usually find Pradhan ji gently dusting my belongings with a pink feather duster that he had acquired on a business trip to India. “Rajeev Sir, if I call Lokendra Bahadur Chand,” he boasted one evening while seated on a chair next to my bed, “he has to take my call!” He looked at me expecting a reaction but I had no idea who he was speaking about. “If you ever need anything done in Kathmandu, you let me know, and I’ll have Lokendra take care of it for you.” “Who is that” I asked. “Three times he was prime minister! He is from Baitadi.You just wait and see: it won’t be long before he’s back in the kursi for the fourth time. He’s the only one who can handle this mess with the Maoists,” he opined.The word kursi, which means “chair,” denotes the seat of power, a reflection of how deeply the notion of kings and thrones had pervaded even the more democratic organs of government. I was rather surprised to learn that this village in the far western corner of Nepal had access to Singha Durbar (the site of the Nepalese parliament and government ministries). From Pradhan ji I learned how the highest echelons of power needed to plant roots in places like Silanga. It wasn’t all that different from the way in which US blue-blood presidential candidates needed support in rural midwestern states. Pradhan ji turned out to be simultaneously correct and incorrect about his powerful friend. In 2002 Chand would again be installed as prime minister by the king, though he would last only a few months before being pulled from the kursi for failing to quell the mounting insurgency. Pradhan ji’s financial fortunes seemed to waver from making him one of the richest men in the village to utterly bankrupting him. If he could manage to send a truck full of the valuable local pinewood down to the Terai border (where it was usually purchased by Indian merchants) without it being looted en route, his fortunes were up, but this only happened a few times a year. Moreover, Pradhan ji confided in me that one of his brothers was in legal trouble and that the cost of the lawyers had put him in substantial debt. Even in Baitadi, lawyers were loathed. In Pradhan ji’s mind there was only one reason he wasn’t sitting in Lokendra Bahadur Chand’s kursi, and that was his son, Shivy, who suffered from a mental disability. Though eighteen years of age, Shivy, was only in the second grade. He was the laughingstock of the entire village because of how he spoke and walked. Other young children often imitated his wide, staring eyes and uneasy gait. Of all the bullies, the one Shivy feared the most was his four-year-old sister, Gomati, who went by the nickname Dalli (little fat one). Each day when Shivy came home from school, the sight of Dalli, who always wore a ragged pink frock, waiting in the courtyard of their home struck terror in his heart. “Look at my son! What can I do” he said one evening pointing at Shivy, who had just finished eating a plate of clumped rice with buttermilk with his hand. “This is the son God gave me,” he said shaking his head despondently. “I think you should be happy. He’s such a nice person. He never harms anybody,” I said. Shivy was hard not to like. He always wore a jet black blazer with a single, large gold button on it and dress shoes--as if he was attending a party. He also always seemed to have a wide grin on his face, which instinctively made me smile back. He was probably as clever and cunning as his father, if not more so, though it took time with him to realize this. When people made fun of him in the tea shops or the school, he would laugh the loudest, slapping his knee, and confusing those that were ridiculing him. He had the clearest sense of who was good and who wasn’t, based on how people treated him. By observing him, I came to know a lot about Silanga. I always found it odd that the Pant family had such a unique wardrobe, which almost felt European, whereas everyone else in the village seemed to wear tattered rags for work in the field. These were signs of the family’s now-lost prominence and wealth. But my arrival seemed to give Pradhan ji a sense that it was time to make his comeback. On the day the scholarship forms came in the mail, I walked up to the school and told the teachers about the opportunity. A Kathmandu-based organization had requested nominations for two local students to attend college. The cash prize was enough to change someone’s life in Silanga--20,000 rupees, roughly $300. I initially believed it would quite be easy to determine who the poorest student was, based on obvious factors such as their living conditions, but when I and two other teachers embarked on a fact-finding mission to select the two neediest girls in the village, I realized how wrong I was. The first house we visited, about an hour’s walk down the hill from Silanga, was a single room with six family members living in it. As he said this, we were served a plate of oranges by the mother. Krishna Air was the economics teacher at the school. He seemed more skeptical. “How many cows do you have” Krishna Sir asked the father. “How many goats and pigs do you have” “Three cows, two pigs, and seventeen goats,” the father replied. His wife corrected him. “Not seventeen, we have twenty-one goats,” she said proudly, slicing more oranges by passing them through a sickle that she balanced on the floor with her toes. “How much do you earn from just the milk” Krishna Sir asked, sucking on an orange and writing notes on a pad of paper. “Enough to send all my kids to school. I don’t know how much exactly but enough to run the family,” the father said.